This project involves four video projectors in order to literally get a hold of the gallery's physical space, its staff and equipment. The first projection shows the installation of another projector, following on by the display of a third one, that, for its part, closes the loop by showing the set up of the last projector. 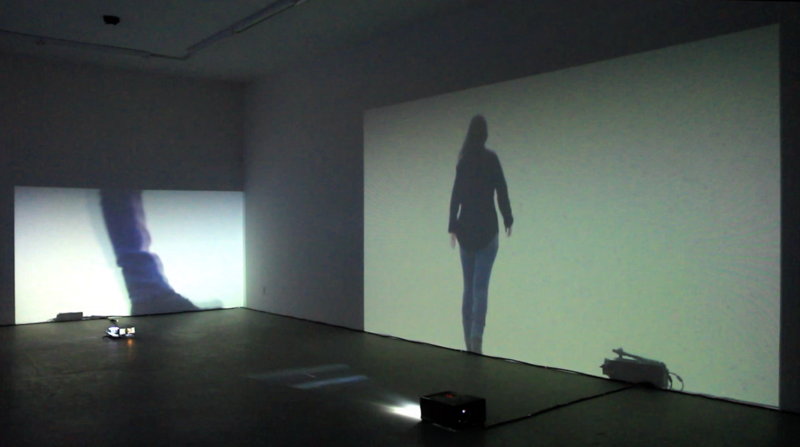 In this game of pursuit, the projected images, exact copies of their projection frame, initiate a sophisticated composition of return to themselves, a mise-en-abîme and duplication of the space, in which the viewer cannot prevent his/her spontaneous emergence, by cutting through the luminous flux.